Padmaja Ruparel is an Angel Investor and President of Indian Angel Network (IAN), India’s first and Asia’s largest group of business angels, comprising the who’s who of successful entrepreneurs and dynamic CEOs from India and overseas. She built this organisation from inception, which over 5 years has over 200 investors with a portfolio of 35 companies across multiple sectors and geographies; operating across 5 cities; providing exits such as 11.5x over 42 months. Apart from building a unique positioning for IAN in the entrepreneur landscape of India, she has also developed an aggressive deal sourcing engine. She has now established a unique model of an incubator which is based on domain expertise and mentoring value that can be provided to young fledgling incubatee companies. This has been established in partnership with the Government of India. The incubator today engages over 400 mentors, has a portfolio of over 20 incubatee companies with a couple of them seed funded within 6 months of incubation. With a wide range of experience of over 25 years, Padmaja has been a key player in the entrepreneurial eco system of India. 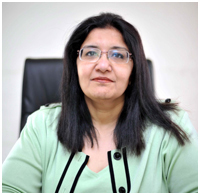 She operationalised the TiE Delhi chapter and set it on a sound footing for it to become most consistently performing chapters of the TiE world with a strong, self sustaining foundation. She has been key in reviving the Indian Venture Capital Association, India’s oldest and largest association of VC and PE firms as CFO of the organisation. In her entrepreneurial avatar, Padmaja has grown a real estate business multifold from US$1mn to US$15mn and from 150,000 sq ft to over 1 mn sq ft. of commercial space. In her corporate avatar at Xansa India (an US$800mn company listed on LSE and now merged with Steria) she joined the team when it was a start up. She led the recruitment plan and operations, built and successfully executed an innovative brand and communication strategy, led the corporate social responsibility initiative which engaged the government, employees as well as the clients. She was a key member of the corporate strategy and M&A team and was the only Indian employee awarded by the Global board of Xansa till 2006.